At Edinburgh flowers, we understand that the delivery of your gorgeous flowers are just as important as the actual arrangement of them which is why our customers are able to choose from a variety of different flower delivery services if you so wish to use them. There is nothing more disheartening for a flower shop other than the hard work of a florist being ruined and your recipient receiving a floral design that isn’t of the best possible quality. 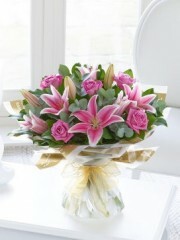 Edinburgh flowers have three flower delivery services on offer which are of the standard, next day and same day variety. All of these are available between the hours of 9:00AM and 5:30PM six days a week Monday to Saturday. 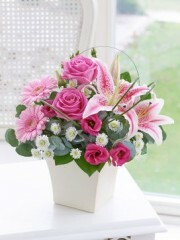 The next day flower delivery service is handy for those who are perhaps slightly more forgetful than others when it comes to dates or for those occasions which have popped up unexpectedly. 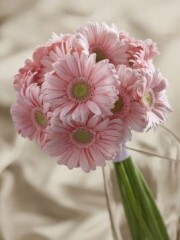 This flower delivery service allows you to place an order the day before the actual delivery meaning that everything is taken care of for you within the space of two days. Similarly, the same day flower delivery service ensures that everything is taken care of for you efficiently as your order is delivered on the day it is placed. This means that the florists work with a very limited time frame which is why, in order to use this flower delivery, your order must be placed before 3PM to give the florists enough time to organise your flowers to the best possible standard. Additionally, distance is not an issue for Edinburgh flowers as the shop is part of the Interflora delivery network which affiliates us with 58000 other florists’ shops worldwide. Through Interflora, Edinburgh flowers are able to ensure your orders are delivered not only locally but nationwide to all the far corners of the UK as well as abroad to over 140 different countries worldwide. 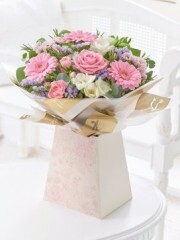 So no matter where your flowers need to be delivered, you can be rest assured that Edinburgh flowers have got your back. 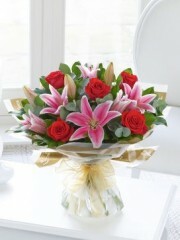 Before choosing a delivery service, you must select the flowers you would like to be delivered to your recipient. Pink is a lovely, delicate colour which is perfect for any occasion but in particular has proven to be very popular among romantic occasions such as wedding anniversaries and Valentine’s Day as well as for occasions such as new born baby events. All the flowers used at Edinburgh flowers have been cultivated and then directly imported to the shop all the way from Holland, a region of the Netherlands, renowned for the premium quality flowers grown there. Not only do the Dutch cultivators provide the shop with good quality but they supply the Edinburgh florists with a huge variety of flowers including pink oriental lilies, roses, pink chrysanthemums, gerbera as well as many others. The florists expertly arrange all floral designs so they bodies of the bouquets are perfectly rounded and balanced by using the right amount of flowers, foliage and filler flowers. All the bouquets are wrapped up in papers, tissues and ribbons whilst flower arrangements come in a lovely vase, box or teacup depending on what sort of finish you’re after. 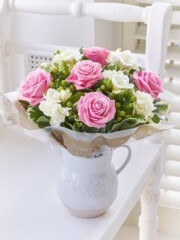 Up on our website there is a varied selection of floral designs on offer in pink tones but if nothing quite catches your eye, don’t worry as all customers are able to use the bespoke service. This service allows you to design a completely unique design which the Edinburgh florists will be more than happy to create for you. If you have any further queries about the services provided at Edinburgh flowers, please do not hesitate to get in touch as there is always someone available to answer all of your questions.